Visiting churches in Ireland? Then you want to see the best, but it can be difficult to choose, as it sometimes feels as if you can't throw a pebble in Ireland without putting a church window in danger. Ireland, known as the island of saints and scholars, is dotted with church buildings. From early medieval oratories to Byzantine extravaganzas; from simple tributes to Neo-Gothic fantasies, the following churches would give you a fair impression of the different styles. Churches do not come any bigger than this—at least not in Ireland. Saint Patrick's Cathedral is the largest church in Ireland. It is the only Irish cathedral without a bishop and was designated as the "National Cathedral of Ireland" by the Church of Ireland to prevent any Catholic attempts at a takeover. Apart from the imposing building itself, other major attractions are the historic tombs and several statues. Many visitors come specifically to see the graves of Jonathan Swift and his beloved Stella. The Whitefriar Street Carmelite Church is famous for holding the relics of Saint Valentine but these need not be the only reason for a visit. Though reminiscent of a forbidding fortress from the outside, the interior of the church is resplendent with colorful decoration and statues. Towering on two opposing hills in County Armagh, dominating the "Cathedral City," the Church of Ireland and Catholic Cathedrals are dedicated to Ireland's patron saint. While the old-fashioned cathedral belonging to the Church of Ireland can trace its ancestry back to the saint himself, the neo-gothic extravaganza of the Catholic Church was only built in the 19th century. Both feature several depictions of mainly Irish saints on murals, as statues, and in glorious stained glass. Resembling a boat turned upside-down, this ancient church is one of the historic gems on the Dingle Peninsula in County Kerry. Nestled organically into the landscape, it would be easy to miss without a guide. Built to commemorate the 1500th anniversary of Saint Patrick's mission (working from the assumed date of 432), this small church in County Down is remarkably restrained. The campanile, or bell tower, is in the classical shape of an Irish round tower and seems to be the only fanciful bit of architecture. A small stained-glass window picturing Patrick himself is the only decoration—a fitting tribute to a man who saw himself as the humblest servant and built his first church here. Built on an artificial bed of sandstone and erected between 1859 and 1919, this cathedral exemplifies the French Gothic style. 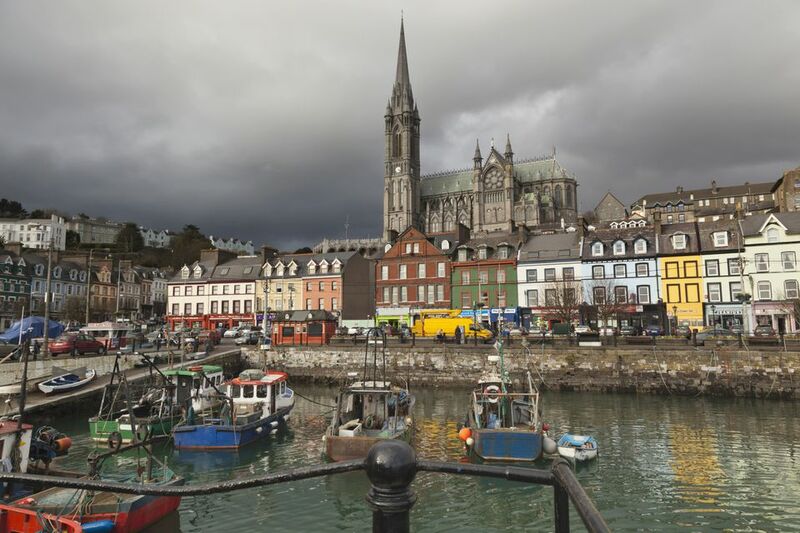 This County Cork cathedral features rose windows, high pointed arches, octagonal towers, and several fine gargoyles. These features combine for a very continental, even Mediterranean effect—especially noteworthy is the Sacred Heart Chapel, decorated with Italian marble and a fine mosaic floor. This was the first stone building in Dublin, erected by the conqueror "Strongbow" for his close associate, Archbishop Laurence O'Toole. O'Toole, now a saint, is still in residence—his mummified heart can be seen in St. Laud's Chapel, near to the mummified bodies of a rat and a cat which were both found in an organ pipe around 1860. Christ Church is unusual in having a huge crypt, with cellars being a rarity in Dublin. Today, the crypt is a museum of the cathedral's long history. Well-hidden and passed by thousands who never even notice the entrance at Saint Stephen's Green South, this is one of the strangest churches in Dublin. Built at the height of the Catholic Revival to serve the new university, it was decorated in a Byzantine style, thus looking almost out-of-place in Dublin City. The long, narrow, and high church has strange proportions but a wealth of decorative detail.